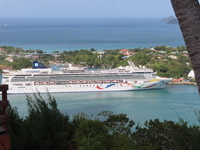 We chose the Norwegian Dawn as our first cruise based on the destination and ship size. We had reservations after reading reviews but our worries were put to bed after we arrived for our trip. 1. Embarkation and check in were very quick as we weren&apos;t in the initial group boarding, it literally took a few minutes with no wait in line. 2. Disembarkation went equally fast with a very organized and efficient baggage handling. We were surprised as we&apos;d read about surfing a sea of bags on the port dock for other cruise lines. 3. Cleanliness is amazing. My spouse handles training in hospitals and universities for sanitation and sterilization; he was impressed at the level of care provided by staff. He commented that in most instances, he saw care and upkeep at a level close to or better than at a hospital level. 4. Our mini suite cabin was fabulous with copious amounts of closet and storage space. The room was large with a sitting area and large bathroom. 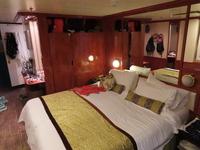 Our cabin steward was fabulous and kept our suite immaculate at all times. We&apos;d read reviews about noise being under the cafe and in reality we had very little noise at all. 5. The dining was wonderful with fresh new menu choices daily, along with the standard offerings. We had no problems getting seated whenever we arrived. Our meals were excellent and the staff very attentive and accommodating. We never left a dining venue without having a great food experience. 6. All the entertainment was very good, we weren&apos;t able to see or participate in everything they offered and will have to cruise with more days at sea to experience it all. Top notch entertainment and theater shows. 7. The staff on this ship would do anything to make your trip a special experience, we had a hard time deciding who we would add as our most favorite staff member. Hint: it was a toss up between our cabin steward and Richard the cruise director. 8. We chose not to book port excursions and had a great experience with port bookings. We didn&apos;t have any excursion credits for this cruise, we will book shore excursions with our next trip. We didn&apos;t travel with children or another couple for this trip. Overall, we found many passengers to talk and tour with and were very happy for this experience. We are already planning our next cruise after having such a nice first cruise experience. 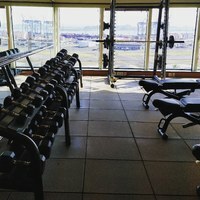 The onboard gym was impressive. 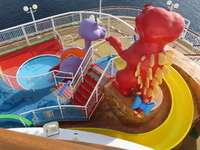 We chose the Norwegian Dawn as our first cruise based on the destination and ship size. We had reservations after reading reviews but our worries were put to bed after we arrived for our trip. 1. Embarkation and check in were very quick as we weren&apos;t in the initial group boarding, it literally took a few minutes with no wait in line. 2. Disembarkation went equally fast with a very organized and efficient baggage handling. We were surprised as we&apos;d read about surfing a sea of bags on the port dock for other cruise lines. 3. Cleanliness is amazing. My spouse handles training in hospitals and universities for sanitation and sterilization; he was impressed at the level of care provided by staff. He commented that in most instances, he saw care and upkeep at a level close to or better than at a hospital level. 4. Our mini suite cabin was fabulous with copious amounts of closet and storage space. The room was large with a sitting area and large bathroom. Our cabin steward was fabulous and kept our suite immaculate at all times. We&apos;d read reviews about noise being under the cafe and in reality we had very little noise at all. 5. The dining was wonderful with fresh new menu choices daily, along with the standard offerings. We had no problems getting seated whenever we arrived. Our meals were excellent and the staff very attentive and accommodating. We never left a dining venue without having a great food experience. 6. All the entertainment was very good, we weren&apos;t able to see or participate in everything they offered and will have to cruise with more days at sea to experience it all. 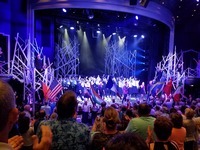 Top notch entertainment and theater shows. 7. 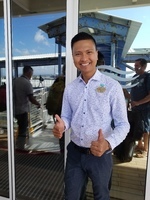 The staff on this ship would do anything to make your trip a special experience, we had a hard time deciding who we would add as our most favorite staff member. Hint: it was a toss up between our cabin steward and Richard the cruise director. 8. 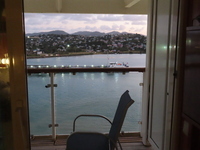 We chose not to book port excursions and had a great experience with port bookings. We didn&apos;t have any excursion credits for this cruise, we will book shore excursions with our next trip. We didn&apos;t travel with children or another couple for this trip. Overall, we found many passengers to talk and tour with and were very happy for this experience. We are already planning our next cruise after having such a nice first cruise experience. We read reviews that there was noise from the garden cafe above some of the cabins on level 11. We had no issues with noise or any other sounds. Our cabin was peaceful and conveniently located by the elevators. The pool and cafe were one floor above us which made our trip very convenient.